The 22nd January 2015 saw the launch, at Hendre Lodge, of The Provincial Grand Lodge of South Wales 2021 Festival, in aid of the RMBI. This is an opportunity for South Wales Masons to show how they are ‘Committed to Caring’, by supporting and assisting fellow Freemasons and their relatives in their time of need. The Festival Committee has set us a challenging goal to raise £5 million over the next six years. However, this is not as daunting as it appears. If each of us, with our present membership numbers, contribute at least £500 over the Festival period, with Gift Aid Tax relief and other fundraising events this target is achievable. By making a minimum donation of £500 you will receive a Festival Jewel and I urge and encourage you to wear it with pride. There will be awards to recognise the achievement of Lodges, Bronze for an average of £500/member, Silver for an average of £800/member and Gold for an average of £1000/member. The funds raised will enable the RMBI to continue their vital work in delivering the highest standards of care to over 1,000 residents in its Homes and continue to expand its range of services provided. 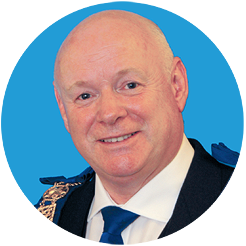 We are fortunate that in Porthcawl we have Albert Edward Prince of Wales Court right here on our doorstep and in Llandudno, North Wales, Queen Elizabeth Court each doing outstanding work to provide a happy and safe environment for residents and offering peace of mind by ensuring a home for life. The South Wales 2021 Festival is a wonderful opportunity for all of us to give something back to this deserving cause and to show just how big a heart we really have by committing to helping the RMBI for the next six years. The M.E. Grand Superintendent, Excellent Companion David Westall is lending his full support to the Festival Appeal, thus reaffirming the strong and enduring link between the Craft and Royal Arch Chapter. Other Orders in South Wales will also be as supportive and committed as they have been on previous occasions. I am grateful and delighted that they are in full support of The Provincial Grand Lodge of South Wales 2021 Festival, in aid of the RMBI. Brethren WE can raise £5 million over the next six years but only if we act NOW and commit to a covenant. Please contact your Charity Steward today and show your commitment to this most worthy charity the RMBI. Remember donations can be as little as £2/week – less than the cost of a pint of beer! I know I can count on your support. Rt.W Bro Gareth Jones O.B.E. The RMBI has been caring for older Freemasons and their families for over 160 years. There are 17 care homes across England and Wales offering high quality care. 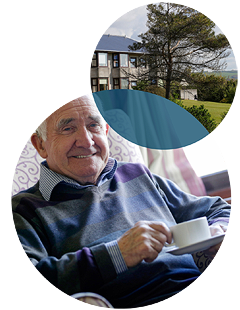 The Homes are registered for both residential and nursing care and a number offer specialist dementia care. Whatever services people need, the RMBI cares for them professionally and kindly. They treat people as individuals – and work together with everyone to design a care plan that meets their needs and allows them to experience wellbeing and meaningfulness. Purpose-built in 1973 and refurbished in 2000, Albert Edward Prince of Wales Court stands in extensive, well-kept grounds situated one mile from Porthcawl town centre and the Promenade. Within the grounds there are beautiful inner gardens made up of a fishpond, scented garden and herb garden for residents to sit in, relax and enjoy the outdoor space. There is also a bowling green and Club House in the grounds where matches are played throughout the season. Residents may participate if they wish. The Home is divided into six ‘family-style’ house group units, each with their own team of care staff. Each house group has its own comfortable dining room and communal lounge. The challenge is to raise £5 million over the next six years. By making a commitment today, to donate by covenant, as little as £2 per week, with Tax Relief we can achieve this target. But it is important that we make that commitment NOW! The easiest way to show your support is to contact your Lodge or Chapter Charity Steward. They have all the information on the various ways Lodges and members can donate, including Regular Promise to Pay and single donations, all of which can now be completed online. The Province would also like to encourage all members to become Festival Stewards and proudly wear a Festival Jewel. Details of these can be obtained from your Lodge, Chapter Charity Steward. As with all Festivals, it will involve a lot of hard work, but it’s hoped that along the way we will also have a great deal of fun, enjoyment and, above all, see lots of money being raised. The Province will be organising a number of social, sponsored and fun events for you, your family and friends to get involved, so look out for details on the website and expect to hear more from your Charity Steward. What does the RMBI do? The RMBI cares for older Freemasons and their families as well as some people in the community. Caring has been their way of life since 1842 and they provide a home for over 1,000 people across England and Wales – while supporting many more. How do I apply for an RMBI care home? RMBI services are available to people with either private or public funding. Residents who have the means will have to pay for their accommodation and care. Places are granted on the basis of need following an assessment, not on masonic rank, time spent on an application list or ability to pay. What makes the RMBI different from other care providers in the public and private sector? The high standards of accommodation and care are closely monitored. Residents also enjoy an affinity with each other from their masonic association. Residents who choose an RMBI Home have the security of knowing that they have a home for life regardless of any change in their financial circumstances, as long as the RMBI can cater for their particular care needs. Why should I support the Festival? Unlike the majority of non-masonic charities that receive donations from the wider public, the RMBI is solely dependent upon donations from Freemasons, particularly through Festival appeals. The money raised from Festivals enables the RMBI to provide residents with a home for life. RMBI care home Albert Edward Prince of Wales Court is a local example of the outstanding work of this charity.